Yay! Another Feat for Adventuroj! | The Adventures of AdventuRoj! Yay! Another Feat for Adventuroj! People often ask why I blog? Most of them thought it’s for the sake of earning some pennies. Others even thought that I am paid to blog. How I wish I am! But to be honest I am not earning even a single Peso from my blog, I just blog because it’s what I love. I am not blogging for income, numbers, or solely to provide free stuff. I am blogging because I love to write and I want to share my passions, my travel, and my adventures. But once in a while it feels good to be rewarded. Just last two weeks I’ve joined the T’nalak Festival 2012 Blog Writing Contest. It is actually my first formal blogging contest ever! And I am honored to take part in such event for I know that doing so will make me an instrument in promoting my beloved hometown, South Cotabato. That is why when I found out that my entry won the crown, I just couldn’t express my overwhelming happiness. Letting the world know how beautiful it is in South Cotabato is already enough, winning the contest is just bonus! So before I continue my endless ranting, I’d like to share the article below. Feel free to read the other entries of the other participants as well. I’m sure by the end of it all you will no longer have second thoughts to visit South Cotabato, Amo na ya! 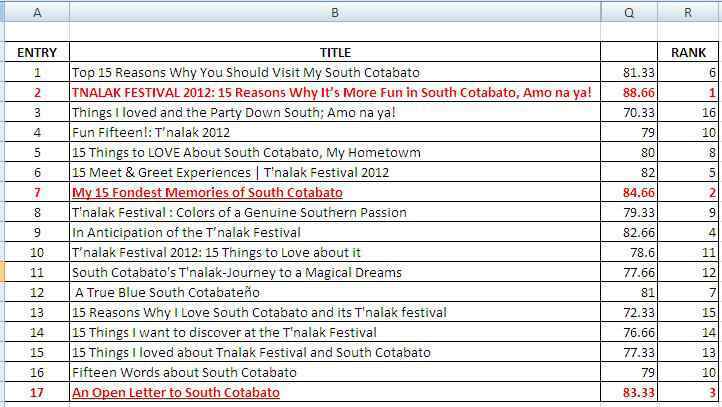 TNALAK FESTIVAL 2012: 15 Reasons Why It’s More Fun in South Cotabato, Amo na ya! Things I loved and the Party Down South; Amo na ya! And now, the winners for the T’nalak Festival 2012 Blog Writing Contest! Our second place goes to Sarah Garcia from Laguna, author of “My 15 Fondest Memories of South Cotabato“. She just won the second place prize of three thousand pesos (P3,000.00) plus a gift pack from SUN Cellular. Third place goes to Grace Nidoy of Columbio, Sultan Kudarat for her blog entry “An Open Letter to South Cotabato“. The third place prize is a two thousand pesos cash (P2,000.00) and a gift item from Sun Cellular. Congratulations to all the winners and thank you to all those who have participated and to our panel of judges- Ellen De Leon Manipon (Journalist, Press Relations Specialist, former ABS-CBN reporter/host), Zhaun Barry Agabe (South Cotabato ACTS), Corie Laraya-Coutts (Author, DJ Macdonald: A Tale of a Malipayon Warrior), Jessie T. Ponce (Travel Blogger, A Traveller’s Tale), Shirgie Fulgencio (Blogger), and Cyril Atanoso (Licensed Civil Engineer, blogs from Doha, Qatar) who carefully vetted the submissions. I’d like to thank all who have made this feat possible – my family, my friends, fellow bloggers, beloved Tupinians, and all those who’ve taken time to visit my blog. I hope you’ll keep coming back for more as I continue to share my adventures from this happy Adventuroj who walks on happy feet. 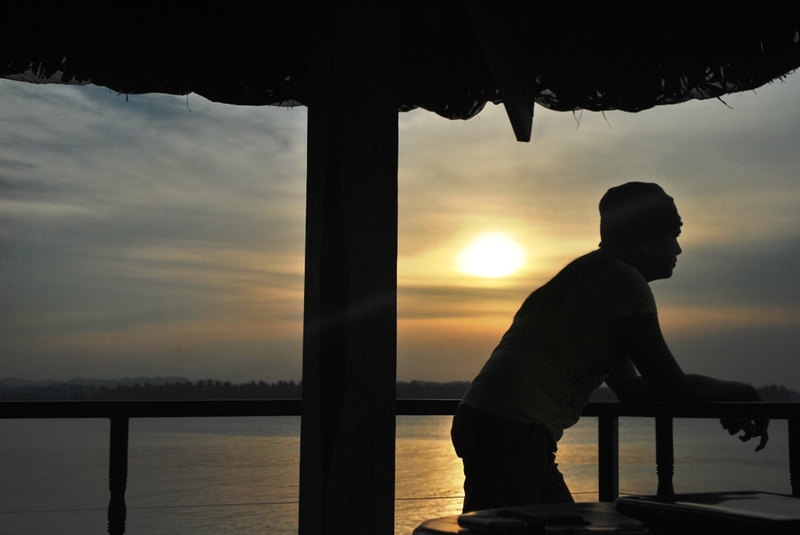 ← TNALAK FESTIVAL 2012: 15 Reasons Why It’s More Fun in South Cotabato, Amo na ya! Congrats to all winners. The prizes are great and even the consolation prize gets a free zipline adventure. Congratulations Roj! That’s why they say, when it is done with passion, it comes back the way you never expected. Awesome! Great to know that you have achieved something out of your blogs. For me, I am still waiting for it to happen. BTW, great to know a fellow nurse here who’s into blogging as well. Congratulation! We all blog for the same purpose, blogging comes as a passion but now ,I enjoys earning too. Your post deserves to win roj – well written and creatively put together. Hope to see you someday when I revisit South Cotabato 🙂 And I agree, nothing compares to being an instrument in promoting your beloved hometown.